Using and possessing marijuana has been legal in Colorado since December 10th, 2013. As of January 2014, you can buy it in stores. Similar to buying liquor, you need to find a specialty store licensed to do so, and have a valid ID. Other than that, the experience varies widely. Note that marijuana is still illegal as far as the Federal Government is concerned, and state law does not trump that of the United States of America. You also can’t just go out and buy pot in Colorado as easily as one might pick up a bottle of Jack Daniels or a twelve pack of Fat Tire. Many smaller communities have made purchasing recreational marijuana illegal or impossible, and others simply don’t have a store with the appropriate license. It was in Moab, Utah, one state over, that we first realized that we were in proximity to a state where purchasing pot was legal. It wasn’t a need for the ability as much as it was curiosity over the action. Like a 21 year old stepping into a liquor store for the first time, it seemed a coming-of-age experience. However, it wasn’t quite so easy. We showed up in Durango, as our previous plans had dictated. Thoughts of seeing what was touted as a vibrant downtown and possibly riding a train to Silverton through what photos had promised to be an amazing landscape had brought us to this little city in Southwestern Colorado. We camped, toured town, visited a brewery, a restaurant, and did some window shopping. The kids in bed, I drove to the closest reefer outlet. “You need a medical license to buy marijuana in Durango,” the clerk told me, hastily. He was apologetic, and clear on his disapproval of the matter, but nevertheless, the law was the law. We were told that we could buy recreational marijuana in Telluride. Two and a half hours away, and in early May, still quite frigid. The trek was not made. So we should quantify. There are three types of marijuana available in the State of Colorado. Medical Marijuana, which requires residency, a license and an annual fee, allows you to purchase pot in dispensaries. The final variety is “black market” pot, the same kind you bought in high school and college wherever you live in the nation. Except, of course, all of the grass in Colorado is incredibly high powered, diesel stuff. So, take a hit and quit if you don’t want to be seeing stars and eating chalk all night. And quite frankly, this is still the primary type of green you’ll end up smoking if you spend some time in Colorado. Because while you can go through the hassle of getting a medical license, or just walk into a store and buy yourself a bag of legal recreational weed, the truth is that in many–if not most–cities, even those where recreational isn’t legal, there will be people lighting up bowls of marijuana on the back porches of every bar, restaurant and hotel. They will offer it to you. You will be legally allowed to ingest it (well, technically you can’t smoke pot in public, but if their are no policemen on the back porch of the pizza shop you’re hanging out at…) and from our experience, there will be no shortage of locals and pot tourists willing to share their wares with you. But what about pot tourism specifically? What does it mean for Colorado? Fiscally speaking, in the first seven months of 2014, the state made over $23 million dollars on tax revenue. That’s not the only relevant number though, as if you consider that around 2,000 people are in prison in Colorado for drug-related offenses, and that 90% of drug offenses are related to marijuana, then multiply that by the $28,000 it costs to incarcerate someone for a year, you get an additional $50.4 million in savings that Colorado will likely see (the state puts the official number at $52 million). So the state stands to profit nearly $90 million dollars by the end of the year just on tax revenue and less expenditures on incarcerated persons alone. Not to mention the economic benefits of more tourism, more people willing to try a substance and purchase it through legal channels, and the resulting boom in Fritos that will no doubt ensue. Violent crime dropped 60% in Denver since marijuana was legalized. There are a lot of other numbers we could throw out. An estimated 70,000 people have been killed in Mexico over the “War on Drugs”, not to mention how many of us are afraid to cross the border because of this war, which if did not exist we’d have just another country to visit right next door. Colorado is not a massive state, it’s the 22nd most populated state. Imagine if the entire country allowed the legal sale of marijuana? California alone would stand to make around $1.4 billion in tax revenue. And again, that doesn’t account for the savings the state, and the country as a whole, would see on not incarcerating these people who’s only crime was inhaling a smoke that slightly alters how your brain perceives the world. As for the effect of pot tourism on the state, hard statistics are difficult to find given that it’s been less than a year since Americans could hop a state boundary and buy the stuff, but a combination of personal experience with actual locals and a little common sense tells the tale. Firstly, medical marijuana has been legal in Colorado since 2000. “My back hurts from carrying ice,” is a valid excuse to get a medical license, and buying pot for medical purposes is untaxed. On the other hand, if you’re an out-of-stater, you pay nearly 30% in taxes. Consider that it’s legal for residents to grow their own pot, and that every single resident I personally hung out with–dozens in fact–had never or only once or twice ever gone to a retail outlet, you can figure that the bulk of that $23 million in tax revenue from the sale of grass came from tourism. Well, aside from the fact that much of the tax revenue goes to education, reports on stings at marijuana retail outlets showed that 100% of the retailers were strictly enforcing the 21 and over law. Consider alcohol and cigarettes, and how many kids can easily get their hands–even by paying with their own dollars–and you can see that those who support legal weed are not looking to lose that privilege. Then again, when every family can grow several plants at home, there’s the possibility of children getting their hands on the stuff. You know, kind of like when every family can legally have a case of beer, a bottle of liquor, or a carton of cigarettes in the house. Still, violent crime dropped 60% in Denver since the drug was legalized. Just because you can buy pot in Colorado, doesn’t make it legal. Back to personal experience. So after an unsuccessful try and purchasing legal marijuana in Southwestern Colorado, we eventually made our way to the city of Pueblo, CO. The first store we happened upon was much like a fancy night club mixed with a doctor’s office. Tall, well-built men in black uniforms checked IDs and one would assume escorted any difficulties off of the property. After providing proof of age, I was taken into a back room a fancy menu touted all of the varieties of Indica, Sativa and hybrids available, as well as an assortment of edibles and drinkables–marijuana infused cookies and beverages. A large window allowed my gaze to drift into a warehouse of pot plants growing happily away without the fear of being seized by some government raid. Hesitant at first, I asked if I was allowed to take a picture. The clerks, who were incredibly knowledgable about their trade, were enthusiastic about my rights to take photographs. It was mind-blowing, really, perhaps more so than the drugs I purchased. Our next experience was entirely different. ID was still required, but the venue–this time in Nederland, Colorado–was more like a friend’s living room. Some strains of marijuana were on sale, a few handmade pipes fashioned from deer antlers were for sale, and a long-haired hippie played his acoustic guitar in the corner for fun. As there are upscale clubs and dive bars, so there seem to be a variety of retail marijuana outlets. On back porches at restaurants and bars alike, across the state, I talked with locals about the law. They largely agreed–buying pot from retail outlets is for tourists–and shared their own personal stashes freely. The conversation would regularly lean toward how good the stuff they grow is, though it was never a “selling point”, that is, they weren’t trying to get me to buy something from them. Instead, there was a general sense of everyone passing around a joint in the name of good stewardship, being a nice host, and general friendship. There was little awe in the words or eyes of Coloradans, for them the ability to more or less puff a pipe had been granted in the year 2000–when medical license became common place–and one could tell that smoking weed was no bigger a deal than cracking a cold one after work. So then, what’s the catch? Is this a scam conceived by Obama to get us all to sign our names on a pot store receipt? 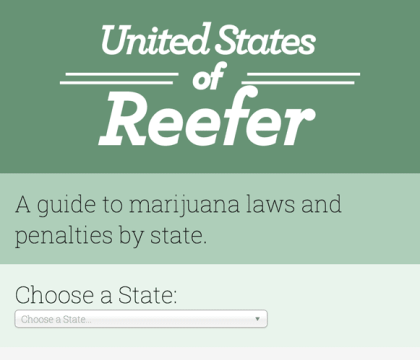 Speaking of transporting pot outside of Colorado, we’ve created an app that shows you where states stand on recreational and medical marijuana, which ones have decriminalized it (fines but no jailtime), and which states are still happy to lock you up for years for smoking pot. Well, the Federal Government stated in 2013 that it wouldn’t interfere with what states do regarding reefer laws. Amendment 64, the law that makes green legal in the State of Colorado, also specifically forbids tracking customer information and supplying it to anyone. What your bank statements say should you choose to use a credit card are uncertain. Security cameras, though, are required in all retail outlets. It’s also worth noting that everywhere in Colorado is not the property of Colorado. National Parks and Forests, and plenty of other land, is actually Federally owned. So NPS Rangers can slap the cuffs on you and do what they will with you, though again, personal experience has never lead me to believe that the same guys who walk around Rocky Mountain National Park all day give a hot damn about what you’re putting into your body, and the general rule of thumb is “keep it discrete”, regardless of where you are, as smoking pot anywhere in public–Colorado or otherwise–is still illegal. Same with indoor smoking, weed is considered the same as tobacco smoke, and that’s not allowed anywhere indoors regardless of what a cannabis club might tout. Oh, and just because you can buy pot in Colorado, doesn’t make it legal anywhere else. So unless you know of a secret underground tunnel from CO to Washington state, the minute you cross the state’s border into another state, you’re just as guilty as you’ve always been for the possession, consumption and/or transportation of a plant that nature intended. So, best of luck, or maybe best just to keep the 420 in Colorado. Our favorite little mountain town in Colorado, Nederland Colorado. Introductory article to our issue on the smaller, often overlooked, aspects of traveling full-time. From buying beer to taking a poop, and lots of the in-between.